The Jura E6 is a premium, and fully automatic, bean-to-cup coffee machine that will look amazing in any kitchen. The main benefit you’re getting with the Jura E6 is its hands-off approach to making your favourite coffee (exactly the way you like it). It can make seven delicious hot drinks at the press of a button. The Jura E6 is one of the best coffee machines around. It’s available in the grey and black colour scheme you can see in the pictures (only) – and is available to buy on Amazon for £695. The Jura E6 couldn’t be easier to operate. As mentioned before it’s an automatic bean-to-cup coffee machine. This means, all you need to do is fill it with coffee beans, water, and milk. All thats left to do is select what type of coffee you want. And doing that is simple too. Everything you need to make a coffee can be found on the machine’s TFT colour screen and steam dial. The drinks include espresso, cappuccino, latte macchiato, Americano and can even be used to make tea. Each preset drink type is fully customizable to match your tastes. If you want the milk a little frothier, or the espresso a little stronger, you simply need to go into the (easy-to-use) settings and toggle to presets. 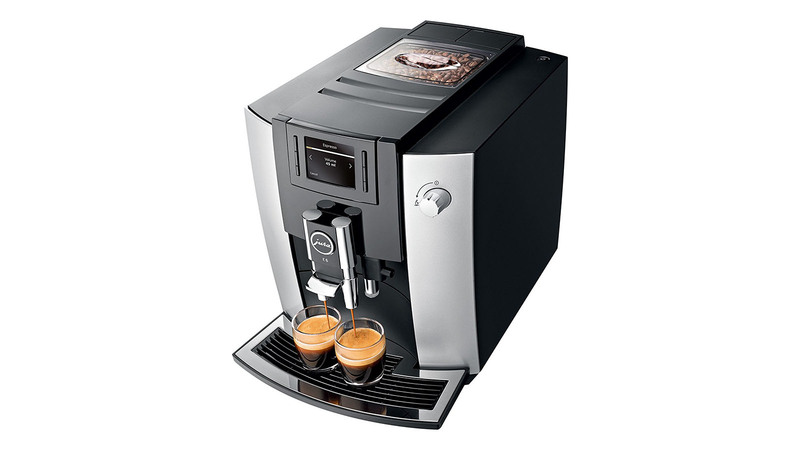 See also: De’Longhi Magnifica ESAM4200 bean-to-cup coffee machine review. Cleaning the Jura E6 is as simple as brewing a coffee. At the press of another button, the E6’s integrated cleaning system begins. The cycle lasts a few minutes as the integrated rinsing of the machine’s pipes takes place. For added cleanliness, the milk spout is detachable and dishwasher safe. …while we’re on the subject of spouts. Both the milk and coffee spout are adjustable to suit glasses or cups up to 113 mm tall. See also: Nespresso Krups Prodigio review. There are two more killer features worth noting. First is P.E.P. This stands for Pulse Extraction Process and is a feature developed by Jura to optimises extraction time. In Layman’s terms, it’s a feature that speeds up brewing times while improving quality at the same time. The second comes in the form of a smartphone app (the holy grail of coffee machine features). With this, you can make a coffee without even leaving your bed. Or sofa. Or wherever. This machine has it all. See also: Smeg ecF01 review: The BEST looking coffee machine of 2017. On a day-to-day level, there are few more things you should know about. Jura Cool Control: While an automatic bean-to-cup coffee machine that makes cappuccinos- and other milk-based coffees – sounds like the dream (and it is). There’s usually a problem. How do you keep the milk refrigerated so it doesn’t go off? The answer with most automatic coffee machines is, you don’t. However, the E6 has a solution in the shape of its Cool Control system (prices starting at £95). This works in tandem with the Jura E6 and acts as a mini fridge for your milk. Claris Water Filter: If you live in a city, it’s possible that you’re located in a hard water area. What this means is that water from your tap is likely to be full of chemicals, which ultimately affect the taste of your coffee. To combat this the Jura lets you insert Claris Water filters straight into the E6’s 1.9L reservoir. If you’re looking for an automatic bean-to-cup coffee machine, that looks great and is easy to use, then you’re not going to be disappointed with the Jura E6. At £695, it’s not cheap. But what you’re paying for is the latest in terms of autonomous coffee-making technology. And the end result tastes great.